Traditionally, changing or refining motion paths has taken considerable time out of already tight programming, commissioning or rehearsal schedules. New developments in our Technical Department, however, have seen our team tackle the speed with which we’re able to implement our clients’ previsualisations. Using the 3D creation suite Blender, we can now create animations in-house, allowing us to deliver controlled motion to a technical set-piece far quicker than ever before. Speeding up the feedback and implementation process means efficient show programming and technical rehearsals. Great news for us and for our clients. A recent touring show allowed us to put these new developments into practice. The shows required a series of stunts to be delivered in different arena venues, executed identically each time. Our primary contribution was for a high-octane stunt in which a two-tonne fuel tanker ‘crashes’, traveling though the auditorium, rolling and bouncing on a prescribed path before coming to a stop in front of a stunned audience. The stunt required a 50m length of track running from backstage to front of house. Two winches either side of the track delivered the hoist and traverse. 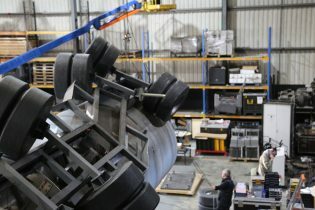 These could run up to 3m/s, with the two-tonne tanker payload rotating beneath allowing the tanker to effectively roll and bounce across the auditorium. 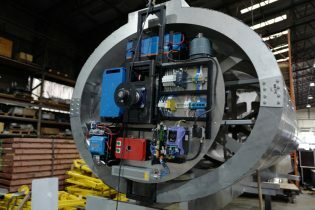 The tanker rotation consisted of an onboard battery powered motor system controlled wirelessly by our show control software, NextQ. 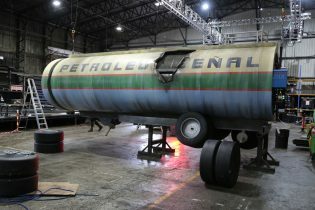 The tanker unit, complete with chassis and wheels, was fabricated in our Metal Shop in a series of four reinforced yet lightweight cross sections and two end panels, our Paint Shop providing the required scenic treatment in line with the show design. We constructed a test rig in our dedicated test build hangar, floating the rig at a height of six metres. Tests began by running the traverse motors up and down to confirm we could achieve the required speed and acceleration. 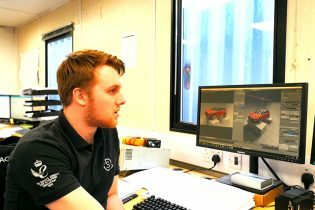 Blender was used to export profiles from the client’s previsualisation which indicated how fast and how far they wanted the tanker to move down the track. The Blender animation is then “plugged in” to NextQ where we can clearly identify what is impossible in a real-world context, and so make necessary animation adjustments to stay within safe parameters. At short notice, we were able to create a 3D rig for a further stunt that was adapted and working in just a few hours, enabling the relevant winches to be requested promptly. The kit was on-site and delivering the stunt within days. Our team also delivered additional technical support including a series of roller drops and drives for a four-tonne train which extended out into the audience. An agile Technical Department is an indispensable resource. Our projects are numerous and diverse, our engineers responding to the creative needs of clients, shows and ceremonies all over the world. Both in-house and on site, the development and implementation of new processes provides meaningful progress, especially in the time-pressed run-up towards a show.